LAS VEGAS, Nevada, January 8, 2013 (ENS) – The Consumer Electronics Show is bigger than ever this year, and among all the new high-tech TVs and tablets, automotive technologies are attracting attention. Ford announced at its CES media event Monday that it is contributing its Sync AppLink system to the public domain, creating an open developer program that lets third-party software developers interface directly with Ford vehicles and create apps for the SYNC-enabled AppLink platform. SYNC is Ford’s connectivity system for phones and music players, while AppLink is Ford’s in-vehicle voice-activated interface, which allows users to control smartphone apps without handling their smartphones. One new app created with the Ford system is Glympse, a voice activated location-sharing app, that can tell family and friends where a driver is and give an expected time of arrival. Also Monday, Toyota and its Lexus Division unveiled its advanced active safety research vehicle, the 2013 Lexus LS. Toyota has committed to new research, both in Japan and in the United States, toward an Intelligent Transportation System, integrating the car with the driving environment. The company’s guiding strategy, called the Integrated Safety Management Concept, views traffic safety as a holistic blend of people, vehicles and the driving environment. The strategy carries through five phases of operation: start of a journey from a parked position; active safety systems designed to avoid a crash; pre-crash aimed at preparing for a collision; passive safety to help survive a crash; and finally, rescue and response after a crash has occurred. The 2013 Lexus LS is displaying what Toyota calls “the world’s most advanced Pre-Collision System.” The system helps the driver avoid or mitigate collisions with vehicles or pedestrians under a wide range of city or highway speeds, even at night. While key components of these research efforts could lead to a fully autonomous car in the future, Toyota says its vision is not necessarily a car that drives itself, but technologies that enhance the skills of the driver. Later in the week, AOL Autos will announce the winner of its first Technology of the Year Award at the CES. Six automakers in three categories – telematics, connectivity and passive safety – have made it to the finals. Cadillac CUE: a full suite of infotainment, navigation and communication tools that integrates vehicle controls with a smartphone or iPod® by means of a the 8-inch LCD touch screen, allowing drivers to keep their eyes safely on the road. The CUE system is offered this year in the all 2012 Cadillac XTS and ATS models, as well as the revamped Cadillac SRX crossover. Audi Connect with Google Maps Street View allows the driver to see high resolution, 3-D terrain and aerial images of routes. The onboard navigation system combines 3-D terrain models with a detailed street network and it seamlessly calculates routes. Chrysler Uconnect Access offers one-button emergency assistance, voice-controlled texting, the ability to monitor a vehicle’s performance, a smartphone app that allows locked doors to be opened when keys are locked inside and headlights to be flashed in a crowded parking place if drivers lose track of where they’ve parked. There is an on-demand wireless hot-spot. The Bing-powered search app is voice-activated and helps find points of interest, specific destinations, restaurants or fueling stations. MyFord Mobile, launched with the new Ford Focus Electric, allows the driver to view the EV’s remaining battery charge, control charging to take advantage of the cheapest utility-rate hours, remotely operate and set timers for climate control, plan trips that get sent to the navigation system, and find charging stations. Nissan Tire Pressure Alert & Refill System tells drivers which tire on the car is in need of air and sounds the car horn when the tire has been filled to the proper air pressure. Honda LaneWatch, which debuted on the 2013 Honda Accord sedan, features tiny camera on the passenger–side mirror can be manually or automatically activated when the right indicator is engaged. Live video then displays on the i-MID screen, and it provides a view nearly four times greater than using the passenger side mirror alone. Opening today and running through Friday, the 2013 Consumer Electronics Show is hosting 3,000 exhibitors at the Las Vegas Convention Center. 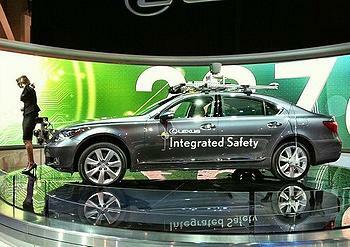 Toyota’s advanced active safety research vehicle, the 2013 Lexus LS, at the 2013 Consumer Electronics Show.